Tegan is consumed by grief, not to mention her anger toward Gabe, who was driving on the night of the crash. But just when she thinks she's hit rock bottom, Gabe reminds her of their Jar of Spontaneity, a collection of their dream destinations and experiences, and so begins an adventure of a lifetime. From the bustling markets of Thailand to the flavors of Italy to the ocean waves in Hawaii, Tegan and Gabe embark on a journey to escape the tragedy and search for forgiveness. But they soon learn that grief follows you no matter how far away you run, and that acceptance comes when you least expect it. I wasn't able to attend BEA, but the Alexa mailed me a stack of books as a sweet surprise! Most of them were ones I'd mentioned were on my radar, but I'd never heard of Come Away with Me before pulling it out of the box. I knew Alexa grabbed a winner the second I read the cover of the ARC and saw a blurb from Taylor Jenkins Reid, one of my all-time favorite authors. And when I looked up the book on Goodreads, I fell in love with the cover. A promising blurb + an intriguing summary + a gorgeous cover = high hopes! Thankfully, Come Away with Me lived up to my expectations and more. Tegan Lawson had everything she wanted until a terrible car accident changed her life. She can't escape her grief - or her anger at her husband, Gabe, who was driving the car. At her lowest point, her husband remembers their Jar of Spontaneity. It's a jar filled with their dreams: trips they want to take and things they want to do. It becomes their lifeline. They go from bustling Thailand to delicious Italy to peaceful Hawaii. It's an adventure, an escape, and an unraveling. Will they find forgiveness or will their past haunt them no matter where they go? Brown's debut captivated me. One of my favorite aspects of Come Away with Me was the focus on travel. The places came alive in this book! I felt like I was seeing through Tegan's eyes and watching elephants in Thailand, cooking in Italy and surfing in Hawaii. Each place is marked by a moving experience, and each experience serves as a catalyst for Tegan's grief and healing. I loved the idea of a Jar of Spontaneity, and I loved the purpose it served in this book. While Tegan and Gabe take a literal journey, there's also an emotional one. 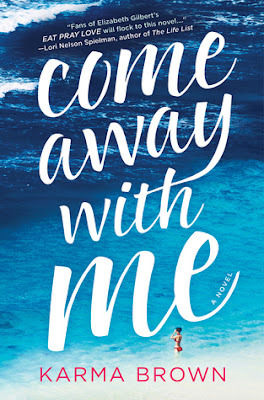 Come Away with Me was a raw, moving book. I felt so tied to Tegan's emotions - her highs and her lows. I felt for her and was frustrated by her. I understood her anger, and I was repelled by it. I sympathized with her grief and yet wanted her to be able to escape its fog. I loved her sense of adventure and identified with her lingering fear. While Tegan wasn't always relatable, she did feel realistic. And I'm glad I got to meet her! I thought I knew what to expect from this book, but Brown surprised me at every turn. Come Away with Me took my expectations and turned them on their head. I'm so glad Alexa sent this book my way! If you're a fan of adult fiction, I'd definitely suggest picking up this book. And even if you're not, I think you'll find something to enjoy in Tegan's story. The journey isn't always easy, but the end result is worth it. 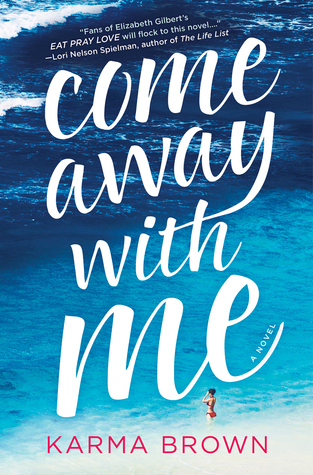 I'm seriously so pleased that Come Away With Me ended up being a great read (for you and me both)! I love how Karma Brown told Tegan's story. And I love how she made all three places she visited come alive for me (and made me want to go to those places myself). So thrilled this one was one we mutually enjoyed! Thank you Alexa for passing this on, and thank you Hannah for such a fantastic review -- I'm so glad you both enjoyed the book! I loved this book too! I really felt she captured each location perfectly. And in no way was I expecting the ending, it definitely caught me by surprise, but I kind of loved that it did.